int(19) 82 Pattern E-tool carrying case for 53 pattern shovel. 82 Pattern E-tool carrying case for 53 pattern shovel. Re: 82 Pattern E-tool carrying case for 53 pattern shovel. Interesting.... I've never seen that one before. The 53 pattern shovel is not for this carrier, the fold up shovel fits this carrier, the hole is for drainage or dirt, I was isued this set in the early eighties and still have one, the 64 pattern carrier is the same except no plastic tangs to attach to the belt, just a velcro flap. Tankermike wrote: The 53 pattern shovel is not for this carrier, the fold up shovel fits this carrier, the hole is for drainage or dirt, I was isued this set in the early eighties and still have one, the 64 pattern carrier is the same except no plastic tangs to attach to the belt, just a velcro flap. I'm not so sure about that. The same style shovel (53 pattern) was issued with the 64 pattern equipment. Sure, a tri-fold shovel may fit but I'm sure the opening in the bottom was intended for the wood handle to fit through. I've never seen any other kit with a drainage hole that size. Normally a grommet or two is sufficient to drain unwanted water. The standard 82 pattern carrier for the issued tri-fold shovel only has a small grommet on the bottom to drain water and the body is longer in length. I can confirm that this carrier was indeed designed for the 1951 Pattern Entrenching Tool. This carrier, which is basically a copy of that which was issued with the 1964 Pattern, was the first carrier type manufactured for the 1982 Pattern. 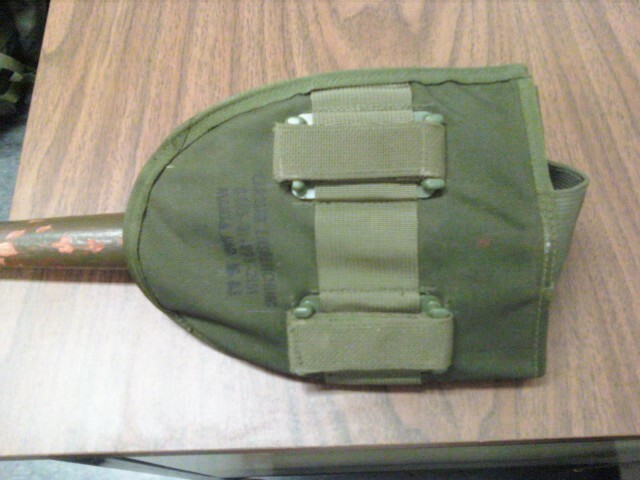 It was replaced within a year by a larger sleeve type carrier for the new folding shovel that became the standard entrenching tool for the 1982 Pattern. If you run a check on the NSN number, you will see that it is listed as the Carrier for the 1951 Pattern Entrenching Tool. I have both the 51 pattern shovel carrier for the 82 webbing as well as the newer one, the 82 pattern shovel is significantly larger than the 51. I was first issued the 64 pattern webbing then the 82 pattern webbing, I have never seen anyone wearing this type of shovel in my years in the CF. Why have a shovel from the 1950's with modern web gear, both sets of webbing I was issued had the three fold shovel. Also if I remember there were two versions of the 82 pattern shovel, both were three fold style, but one shovel was bigger than the other. 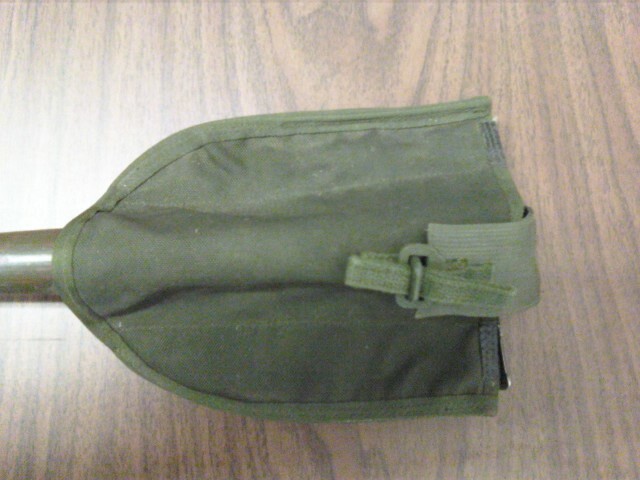 I looked at my 64 pattern webbing and the carrier has leather reinforcemnts on the lip for the three fold shovel. Just because it doesn't seem to make sense doesn't mean it isn't true. It's common for issue items to be re-purposed or used in a way that they were not originally intended. Don't confuse the way you used a piece of equipment with it's official intended purpose.